On a cold, rainy, early spring day last March, assistant food editor Hilary Meyer and I were testing recipes in the EatingWell Test Kitchen. Conversation segued into Whine Fest 2010 about our gardening prospects for the upcoming season -- I had moved into a new apartment that didn’t have any space to garden and she was sick of trying to coax tomatoes and other sun-loving plants from her decidedly shady garden. Then, a eureka moment: there was plenty of flat, sunny, open land right next to our office. Why not plant a garden there? With the help of our husbands, we transformed a pretty substantial chunk of land into a really amazing garden. It took a ton of time, but we definitely reaped the benefits through countless pounds of vegetables. The best part was shopping in our own garden as we left the office at the end of the day -- way better than stopping at the grocery store! We learned more than a few lessons over the months that we spent stripping sod, tilling, spreading compost, planting and harvesting. We wrote about our EatingWell garden in the March/April issue of EatingWell Magazine, where Hilary compiled this list of 5 essential tools to help you get your garden off to a good start. 4. 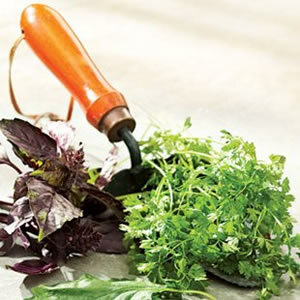 Three Basic Tools: Use a trowel to dig small holes for planting transplants. Pull up young weeds at the root with just a gentle back-and-forth motion using a stirrup hoe. A garden rake helps to level beds and filter out large stones that may interrupt seedling growth. 5. Helpful Books: The Vegetable Gardener’s Bible by Edward C. Smith (Storey, 2009) features his WORD system—Wide rows, Organic methods, Raised beds & Deep soil. It’s approachable for beginners and insightful even for experienced gardeners. Detailed plant profiles are an easy reference. If your idea of a vegetable garden is a beautiful, whimsical space that not only provides food but is an oasis in your backyard, you’ll find inspiration in gardening guru Ellen Ecker Ogden’s latest book The Complete Kitchen Garden (Stewart, Tabori & Chang, March 2011). She includes 14 themed kitchen gardens, from a salad lover’s garden to a chef’s garden, along with garden plans, plant profiles and recipes to use up the harvest. What are you looking forward to growing this year? Carolyn Malcoun combines her love of food and writing in her position as contributing food editor at EatingWell. Carolyn has a culinary arts degree from New England Culinary Institute and a degree in journalism from University of Wisconsin—Madison. Carolyn lives in Portland, Maine, and enjoys cooking, gardening, hiking and running in her free time.